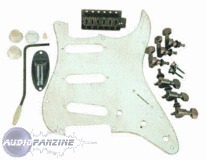 Hardware Kit, Other Guitar Accessory from Axl Guitars in the Badwater series. AXL presents the Badwater Hardware Kit for players who want to customize their guitar. The Badwater guitar line features "antiqued" finishes and hardware that Guitar World labeled "anything but run of the mill, and a first for the budget-guitar market," according to AXL.The Badwater Hardware kit is designed to help a guitar achieve the same kind of road-worn look and feel without an expensive "relic-ing" process. The Badwater Hardware Kit (PG-820) comes with an aged pickguard cut for 3 single-coil pickups, two tone knobs and one volume knob, a selector switch tip, output jack plate, bridge assembly and tremolo arm, six tuning machines, and a set of strap buttons and mounting screws. Each plastic component has been antiqued and every metal piece has been anodized for "a unique look and vintage feel." Badwater hardware comes standard on AXL Badwater Series guitars, including the V-styled Jacknife. AXL Guitars is also the builder of the Mayhem, Bloodsport and Marquee Series of electric guitars and basses. 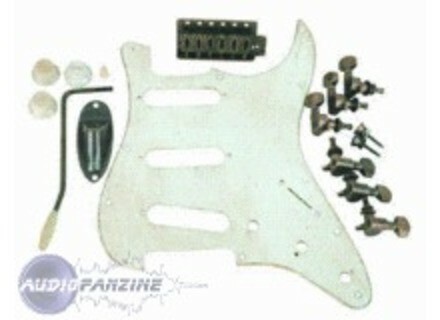 For more info, visit www.axlguitars.com. VHT Standard Series 12 VHT has announced the release of the first handwired amplifier from "The Standard Series," The Standard 12.